I would like to share some of these experiences with you through my Art below. This Blog contains the following contents relating to my Art. They are exhibited at the rear (follow passage to the left) of the Mitchell Art Gallery in Warwick England UK. Telephone 01926 408787 and/or visit their website at http://www.mitchellgallery.com to view and/or purchase stock. A big thank you to the Local Courier Newspaper who have supported me over the years by publishing my Press Releases and promoting my Art and the Artist. Warwick Court House oil painting portrayed at night with the Thomas Oken Tea Rooms bathed in moonlight from above. The Court House painting, was commissioned by a Mr Nigel Grainger, former pupil at Warwick School (see image below) and spouse of the Mayor of Warwick 2014. For details of Mayor’s Charity Project, relating to the Court House painting, please follow my link below. It was a challenge and a privilege to create this painting. The original painting is on display at the first floor of The Court House building in Warwick with an appropriate plaque underneath. Enjoy a quintessential english tea there! I visited the tea rooms on the 5 Oct 2015 and have returned many times since. Like walking into a time capsule. Very enjoyable experience and the tea and service were very good. A framed print of my Warwick Court House image is on display there. 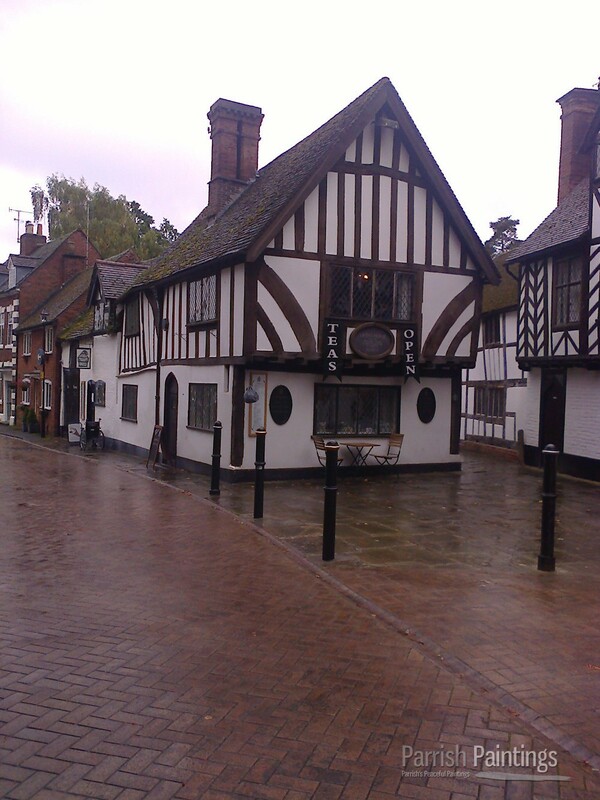 It was the annual Heritage Weekend in Warwick from the 9-13 September 2015 and many famous buildings were open to the public during this time. Including the Guys Cliffe Walled Garden and Guys Cliffe House pictured above. I visited Guys Cliffe House on the Saturday afternoon. The ruins looked beautiful and I did feel inspired as an Artist. It is well worth a look and for its deep history. 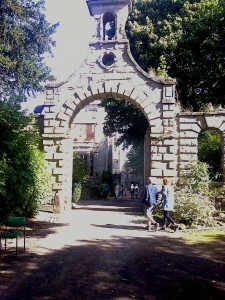 It is believed that there are connecting tunnels beneath Warwick including from Guys Cliffe House to Warwick Castle. The Walled Garden has been run by Volunteers since 2014 and used to be part of the KItchen Garden for Guys Cliffe’s House. I visited the Autumn Fair at the NEC Birmingham (UK) in early September 2015 and met a lady at her trade stand who promotes and represents The Alternative Image Company. It was a pleasure to meet her and we spoke of our interest in Dr Who too. This company publishes a great collection of retro/vintage black and white and colour Greeting Cards and they showed considerable interest in my black and white paintings to add to their collection. See my Railway artwork on Steam Tube website. Warwick Castle painted from the popular vantage point on the road bridge crossing the River Avon. the original oil painting portrays the beautiful historic Warwick Castle. and exhibited at the rear (follow passage to the left) at the Mitchell Gallery in Warwick England UK. This oil painting portrays the historic Mill Street in Warwick. It leads down to Warwick Castle. It was the only street in Warwick to remain intact from the Great Fire of Warwick in 1694. At the bottom of this attractive street is the beautiful Mill Garden, open to the public, adjacent to Warwick Castle. My oil painting of The Crown Court portrayed in session, is now closed after over 500 years. Proceedings transferred to the Justice Courts in Leamington Spa in 2010. Its a wintry scene at dusk and lights are on at Kings High School for Girls, conveys the near end of a school day. In the distance we see Eastgate. a commissioned oil painting by The Mitchell Gallery in Warwick in 2009. 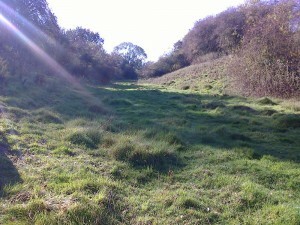 Behind the Hospital is the beautiful Hill Close Gardens adjacent to Warwick Race Course. The charming Snug bar inside the Zetland Arms is no more and the room has been refurbished. This public house dates back to 1926. The charming wood panelled snug before you, is sadly no more. The three gentlemen we see enjoying a drink, are no longer with us. I was fortunate enough to have met them while creating this painting. 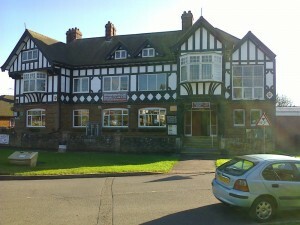 The pub has since been refurbished under new management. Follow link to learn more of its history. The moon shines down on Church Street with the Zetland Arms on the left a little further up the Street. The beautiful St Marys Church, Warwick is illuminated at the top of the street. A climb up the inside of the tower is well rewarded with a spectacular aerial view of Warwick and beyond. Rebecca, one of a fleet of narrowboats built by Kate Boats glides through the water under Offchurch Viaduct on the Grand Union Canal in the late afternoon. Sadly the above station building was demolished in the 1960s. Demolished in the 1960s and replaced by a Car Showroom, just off the Rugby Road in Leamington Spa, towards Old Milverton. I was invited to attend the annual Leamington and Warwick Model Railway Exhibition and my artwork, including Railways will be on show and for sale. I’ve exhibited my art with them over many years and have always enjoyed seeing the fabulous layouts on show from all round the country, including the local Club layouts. There are numerous Model Railway/Preserved Railway related trade stands there too in support. Follow link below regarding the Club. Visit the Classic Train and Motorbus, a Model Railway Shop located in George Street, Royal Leamington Spa. They do stock some of my Railway images in the form of Greeting cards and Postcards. The staff are friendly and knowledgeable about Railways. The rare sight of pedestrians walking in the Parade during the day and not a vehicle to be seen. The Parade was pedestrians only, in early August 1971, only for a short period (no vehicles at all) as an experiment to encourage pedestrianisation by the local Council. Th oil painting portrays a sunny Saturday morning. It was part of a sell out Art exhibition at Warwick Studios Gallery in Leamington during 2008. The oil painting looks up Bath Street from the corner of Abbotts Street, in the 1960s. We have Curry’s shop on the left in the foreground. A Fine fare supermarket can be seen up on the right hand side. The beautiful gardens were built in honour of Sir Henry Jephson who helped promote the healing properties of the Spa Waters for the poor residents of Leamington Spa at the time. The Spa waters are located in the Pump Rooms on the right of my image. I play and enjoy following tennis and was very pleased to see Andy Murray from the UK win Wimbledon in 2013 after a period of 77 years since Fred Perry won it last. Andy is portrayed here in oils, visiting my local Club and this is my tribute to him. Leamington Lawn Tennis and Squash Club. Framed Portrait prints of Andy Murray and Ann Haydon Jones and other British Wimbledon Champions are on display in the Club House on Guys Cliffe Avenue. I created this painting of Oscar Peterson in concert for tennis friend and jazz musician Will Allen who I play now and again at the Leamington Lawn Tennis Club. Will commissioned me to paint it as a gift to a dear friend who is also an Oscar Peterson fan. It was Oscars 90th birthday anniversary on the 15 Aug 2015. 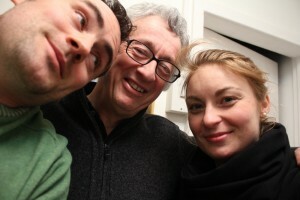 Will, in turn kindly supplied the musical tune for my Promo Video on the homepage of my website. The title of my image was inspired by a 20 minute piece of music entitled ‘Nous Sommes Du Soleil’ (We are of the Sun)from the Yes double album entitled ‘Tales from Topographic Oceans’. released in 1973 on vinyl and cassette with a gatefold sleeve. Yes have always been one of my favourite Progressive Rock Bands and this album remains very popular with me and the fans today, such is the timeless nature of their music, both instrumentally and lyrically. Yes continue to create great music with their album ‘Heaven and Earth’ released in 2014. Sadly one of the founding members and bass player Mr Chris Squire died at the end of June 2015, portrayed on the right of my image above. He made a massive contribution to the sound of Yes music with his thunderous bass, choir boy backing vocal harmony sound and song writing ability. He created solo albums too and often worked on spin off projects with big names like Steve Hackett and Billy Sherwood. Why not go along to a local Record and CD Fair in South Warwickshire. I have been many times over the years looking to fill gaps in my music collection. Its 1973 and the Moody Blues were attracting huge audiences at their concerts around the globe singing songs about love, peace and harmony. The oil painting celebrates the Moody Blues becoming a Super group in the early 1970s, selling out large Concert venues around the planet. This period is when, in my view, they released their finest albums starting with Days Of Future Passed in 1967 with Tony Clarke as Producer, sadly no longer with us. still play their timeless romantic music. They are the centre of my musical universe. They are still recording new music in 2015. In 2016 it will be 50 years since Justin Hayward and John Lodge joined the band. In 2017 it will be 50 years since Days of Future Passed (perhaps their best album) was recorded. I feel an inspiration coming on to create an anniversary painting to celebrate this milestone. For a tribute to Tony Clarke,(often called the Sixth Moody, because he was so important to the Moody Blues sound as their Producer), why not visit the Coventry Music Museum and see my Tony Clarke portrait painting print and discover more about other Coventry’s musicians. The orchestra plays the Planet Suite inside the Royal Albert Hall, London and the sound of the beautiful music reaches out above into the cosmos. Who knows who may be listening. My ever growing portfolio of genre and associated paintings have been inspired by Art Galleries, Commissioners, the public making suggestions and my own passion for creating fine art from the heart. Coupled with this my interests in Music, Science, Science Fiction and Astronomy are reflected through many luminaries that I believe in and have painted in a surreal style of artwork. An optimist and a traditionalist by nature, I like to reflect a feeling of optimism in my artwork. I mostly work from photographic material, sometimes published, in which case I will change the look of the finished painting in some way to avoid copyright. I am often inspired by looking at photographs, sometimes published, sometimes ones I have taken. Most of my artwork has been developed from sketches, including my surreal compositions. These were inspired by looking at words and lyrics composed by various musical luminaries. From this I visualized my thoughts in my minds eye and interpreted them into a sketch. The canal scenes and some of my railway scene paintings are created from my own photographs. However when creating a period scene, I do some research and change the look of a painting to suit the period. in Royal Leamington Spa after the turn of the century. My paintings were created from sketches developed from taking my own photographs during the day and at night. See The Warwick School Project below as an example. 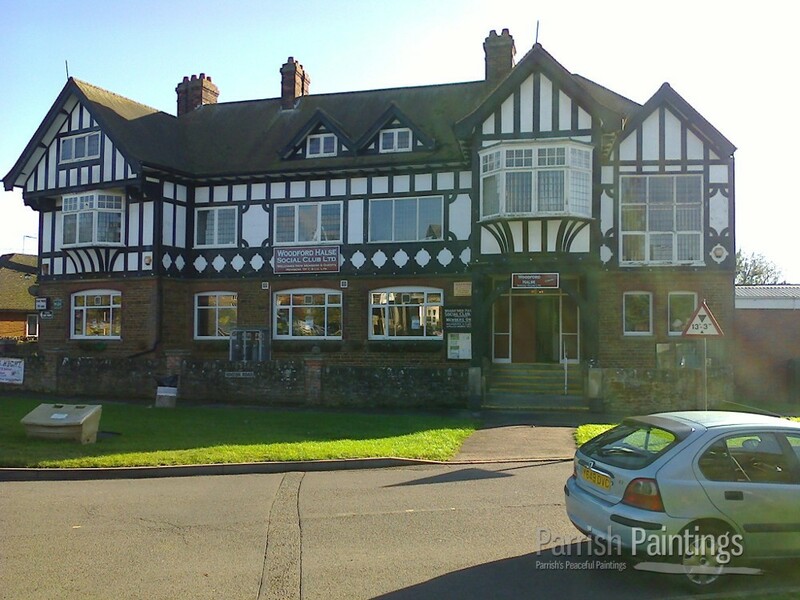 Warwick School in Myton Road, Warwick was a challenging piece of architecture to paint and it was commissioned by the Mitchell Gallery in Warwick during 2011. To create this painting, the Gallery and I, decided on a stretched canvas size of 36in x 24in to give the maximum impact of the look of the building. I was given colour and black and white photographs of the School taken by a professional photographer to use as a reference guide along with my prepared sketch. 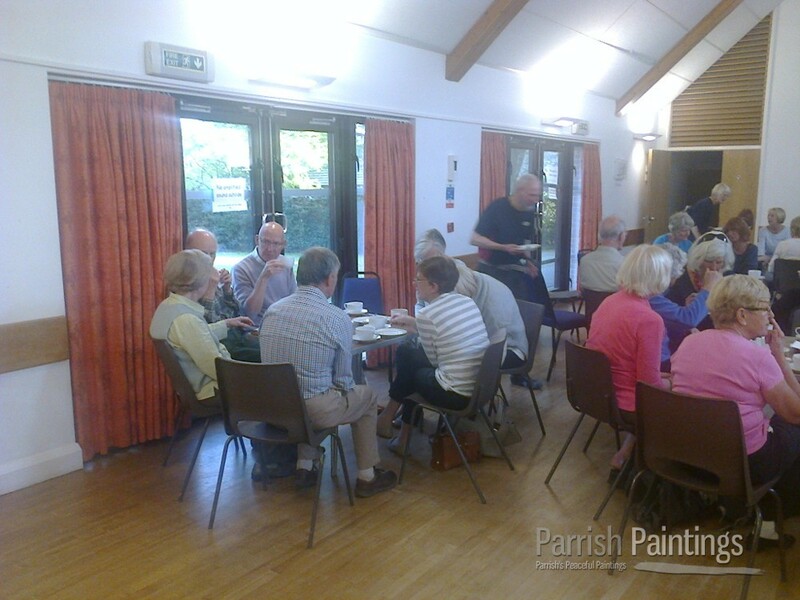 The surface of the canvas had already been prepared by the Gallery with a coat of Gesso primer Paint. So now it was ready to work on. I first prepared the outline faintly on the canvas by using a soft pencil. Then carefully measuring up by ratio sizes from the photographs to gain a degree of accuracy. At this stage, I was working on my drawing board, which I used to use as a Draftsman in my former career. Using water based oils, I applied thin layers of grey paint, adding in liquin and water, which helped spread the paint more evenly on the canvas. Once the form, outlines of the school were complete or thereabouts, I began to paint in the foreground, with the grass and gravel drive by constantly referring to the good quality photographs I had been given. The sky tones were added last, by using liquin, water and a fan brush to help spread the paint evenly. At this stage, I moved the painting onto my easel. By looking at the painting from a distance, I began to eye in fine detail, again closely observing the look and lighting of the school on the photographs. Once these stages were complete , two layers of paint had been added, including the sky, at this point. To achieve final effects, I added in highlights where necessary to help ‘lift’ the painting and bring it to life. The overall time span was over a period of about six weeks, working between other commitments and projects. A Gondola crosses the Grand Canal in idyllic Venice. I have visited the beautiful city of Venice and it is an Artist’s paradise. 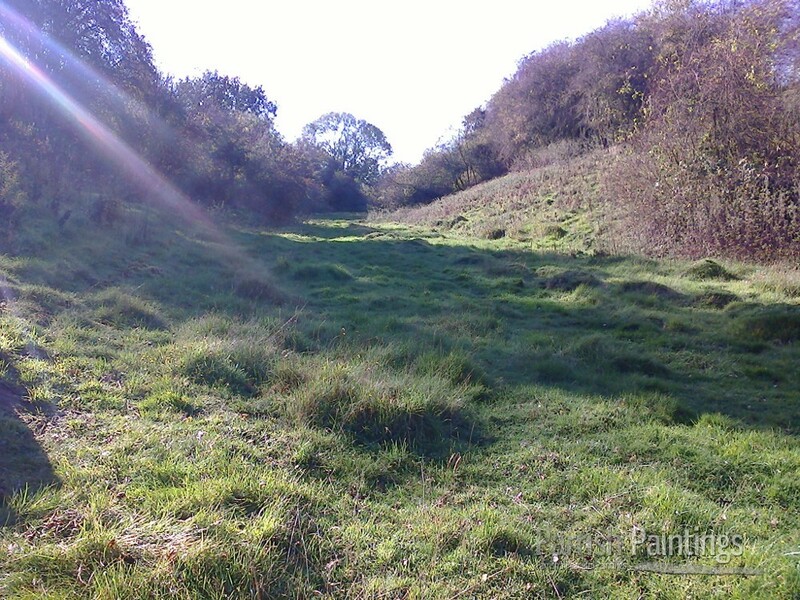 I took plenty of photographs and many of them have inspired me to create an Artist’s impression on the canvas. I attended the Leamington Ramblers 50th anniversary walk and afternoon tea held at the Leek Wootton Village Hall in Warwickshire on the 4 October 2015. It was a beautiful sunny afternoon and we walked in the vicinity of Leek Wootton. 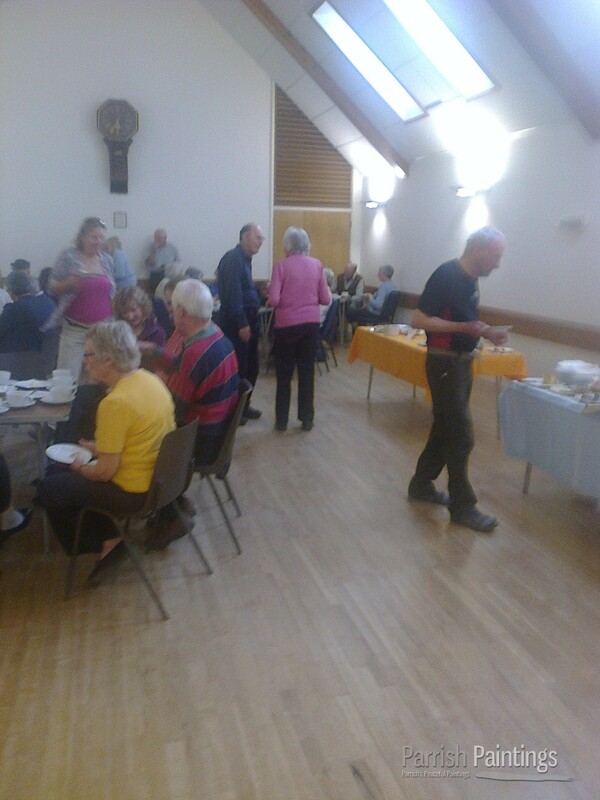 We arrived back at the Hall for afternoon tea at 3-30pm. See above. It was a lovely afternoon, meeting and seeing so many fellow Ramblers. Thank you to all the organisers for this event! I led a Ramble along the former Great Central Railway line near Charwelton, Northamptonshire (UK) 12 August 2015 with four others from the Leamington Rambling Group. The beauty of Victorian architecture is something to behold! 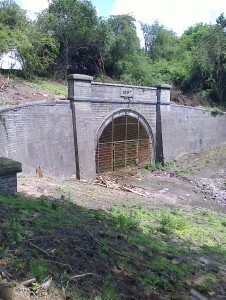 Here we see Catesby tunnel portal (south end) built in 1897 flanked by elegant looking wing walls. Sad that the Great Central Railway is no more. But we have part of the Great Central Railway as it used to be in its heyday (the UKs only main line Heritage Railway) preserved further north at Loughborough Station. My walk was about 6 miles long via the village of Hellidon and the Northamptonshire Countryside was breathtaking. I stopped with a friend for a drink at the Red Lion Pub in Hellidon last Sunday while doing the recce for the walk. It was a pleasant friendly experience with the Pub locals. The north tunnel portal at Upper Catesby was barely visible through the undergrowth. We arrived back at the Fox and Hounds Pub in Charwelton for lunchtime. The food and service were good. We had lunch here on 25 October 2014. Sheep were watching nearby. Woodford Halse Station was opened in 1899 and closed in 1966. I recommend a visit to the Woodford Halse Social Club. Its history relates to the Great Central Railway in its heyday. The top floor of the building houses a 00 gauge model railway of the Great Central Railway in its heyday around Woodford Halse in Northamptonshire. The superbly recreated Model Railway is well worth a look! Follow links below to learn more and arrange a visit. A weeping angel closes in on Sally Sparrow while her back is turned. One touch and she will be sent back into the past to a time before her own birth. Here we have a portrait of Sally Sparrow played by Carey Mulligan in a Doctor Who episode called ‘Blink’ first shown in 2007. This painting was part of an Art exhibition to celebrate the greatest science fiction programme of all. 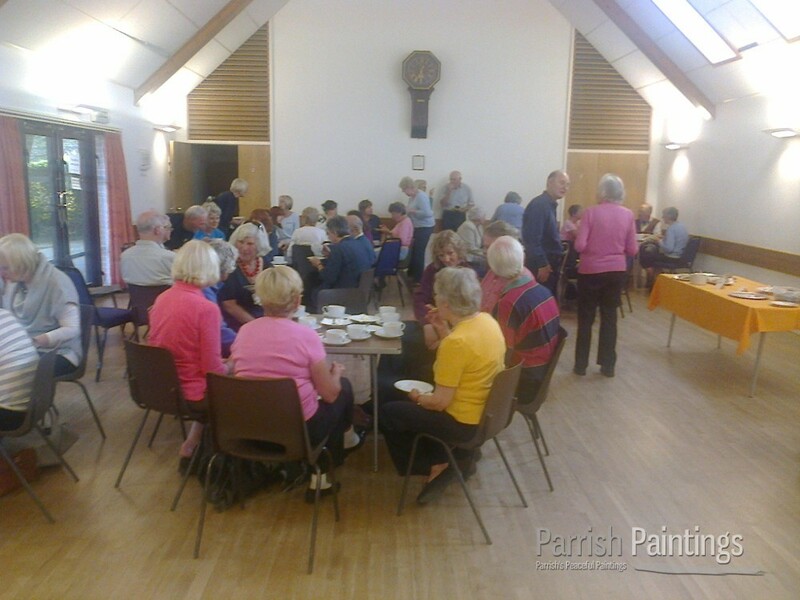 All artwork is original, including oil paintings and sketches, picture postcards and jigsaw puzzles. The exhibition ran from 19 October to 23 November 2013. My Doctor Who artwork can also be found at Coventry Music Museum. A portrait of Delia Derbyshire (joint composer of the original Dr Who theme music) born in Coventry forms part of one of my images on show at the Museum. The Flying Scotsman (portrayed above pulling out of Newcastle Upon Tyne Station in the 1930s) is now back on the rails for tests using the East Lancashire Railway on the 8 January 2015, after extensive restoration work on the Locomotive going back to 2006. I have been involved with the GWR since 2013, creating Railway scenes in oils, portraying Toddington, Winchcombe and Cheltenham Station so far. These images are used on Jigsaw Puzzles which are for sale in the Toddington platform shop. Other merchandise including Postcards and Greeting cards are also for sale. Occasionally I go down and meet some of the volunteers working there and admire the great job they do running the Railway. I also catch up on progress with the re construction of Broadway Station. I take the opportunity to have a train ride as well from Toddington station. Enjoy a great day out by visiting the Gloucestershire Warwickshire Railway. 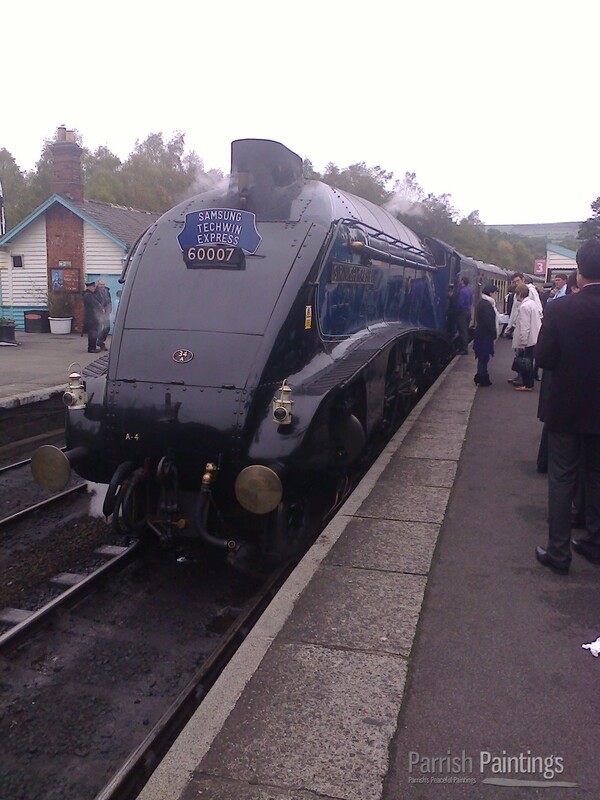 This was a day event at the North York Moors Railway near York during October 2014. The General Manager of Samsung Techwin -Northern Europe (a friend of mine from my childhood) kindly invited me to come along to this event to help promote my railway artwork. The Manager gave a Presentation at Pickering Station promoting Samsungs surveillance equipment in front of an audience of Samsung clients and employees during the morning. This was followed by a Railway journey to Grosmont and back in the afternoon on the North York Moors Railway hauled by the Samsung Techwin Express Pullman train. This comprised of an A4 Class locomotive named Sir Nigel Gresley no 60007, a famous preserved loco hauling a set of luxury LNER pullman cars. We had a 3 course meal on the journey, served by waiters re-enacting the 1930s, from the LNER heyday. A wonderful, memorable day for me to cherish as an Artist and also as a Railway enthusiast. 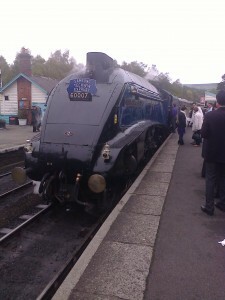 Who will commission me to create a scene portraying the famous blue Sir Nigel Gresley Locomotive no 60007? Follow link below to discover more regarding Samsung Techwins Surveillance equipment. Man on the Moon! Surely mankind’s greatest achievement to date. The new images of planet Pluto in July 2015 are something to behold. Quite astonishing and not what the Astronomers were expecting. Will we ever land a man on the moon again? I always feel this fantastic achievement that took place between 1969 and 1972 when man visited and landed on the Moon on six occasions with the Apollo missions has been under stated over the years. This is my tribute of this incredible achievement in 1969 with men walking on the Moon.